Second to paper, yard waste comprises the largest volume of trash and takes up the most landfill space. Composting is a fun and easy way to keep this rich waste out of landfills and return organic nutrients to the soil without using commercial additives. In addition, the design of modern landfills prevent needed oxygen and water from mixing with organic waste, inhibiting natural decomposition. Below are general guidelines for creating compost. For best results, please follow the instructions received with your specific compost bin. Combine leaves, grass and yard clippings in a bin. The bin should receive an equal amount of sunlight and shade during the day. Add kitchen debris such as fruit and vegetable scraps, egg and nut shells, paper towels, tea bags, coffee grounds and filters. DO NOT include meat, dairy products, fat or grease. EXCEPTION: The Green Cone by Solarcone accepts all food products including cooked and uncooked meat, bones and oil. Alternate food wastes with garden rubbish. 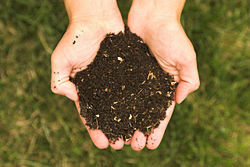 The ideal compost mixture contains three parts “browns” (dry leaves, brush and twigs) to one part “greens” (food scraps, weeds and grass clippings). A balance of damp and dry materials will speed up the composting process. If the pile appears too dry, lightly sprinkle it with water. Periodically turn the materials with a pitchfork or shovel to circulate air and distribute moisture. Don’t be alarmed if it gives off heat… this is nature taking its course! When the mixture has turned to dark brown/black crumbly mixture, add it to your lawn or vegetable and flower gardens. The amount of time needed to create compost varies with the time of year, air temperature, and moisture in your bin. Not only have you diverted organic waste from landfills where it will NOT decompose, but you’ve created a natural soil enhancer for use on your lawn or garden. For more information from experts on composting, visit the website of US Composting Council, the US EPA , Earth911, Virginia Cooperative Extension, or contact the local extension office in your area. Visit our Composting board on our Pinterest page too.